GPS Tracking is blowing by the competition in the iTunes Store as iPhone users discover how useful and indespensible the app really is. Hitting number 2 on the iTunes Top Grossing Apps is no small feat. We thank you for your support and use of GPS Tracking. Once deemed a futuristic concept in science fiction movies, the ability to locate all your friends, family and coworkers instantly at the touch of a button has arrived. It’s really here and it’s so simple to use. 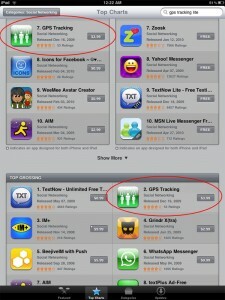 iPhone users can try GPS Tracking Lite for free, or buy the full-featured version for the price of a cup of Jo. Android users please search for “GPS Tracking” in the Android Market for both the Lite and full featured versions. Hundreds of thousands of users can’t be wrong. Try GPS Tracking today and let us know what you think.